17-16 LSU: The Tigers wind down the clock and claim their biggest win of the season over rival Florida! A huge win for LSU and Ed Orgeron, coming into The Swamp and leaving with a big conference win. 17-16 LSU: A crucial LSU tip on fourth down gives the Tigers the ball deep in Florida territory with just over a minute left in the game. 17-16 LSU: The Gators offense continues to drive down the field as they pound it into the end zone only for a botched snap on the PAT to keep them down a point. 17-10 LSU: Florida responds in strong style as they score their first touchdown of the game before a Gators PAT lessens the margin back to a touchdown. 17-3 LSU: The Tigers offense begins the second half with another confident drive downfield before a passing touchdown and a successful PAT puts Florida down 14 now. That ends the first half here at The Swamp with LSU leading 10-3 over Florida. The Tigers will receive the ball to begin the second half here in Gainesville. 10-3 LSU: Another strong offensive drive from the Tigers as Danny Etling leads them to the red zone before a good field goal gives Ed Orgeron's squad a seven point lead with 30 seconds left in the half. 7-3 LSU: Florida finally gets on the board in the second quarter as some strong defense from the Tigers forces the Gators to settle for an Eddy Pinero field goal. 7-0 LSU: The Tigers score a touchdown on the end around from wide receiver Russel Gage and a successful PAT puts Ed Orgeron's squad up here at The Swamp. The kick is off and this SEC rivalry game is underway. LSU won the toss and deferred. Florida will receive the ball first. LSU and Florida have taken the field here in Gainesville. Check back here before game time for pre-game updates, news and notes, warm ups, and more live from Gainesville. If LSU can finally settle on a consistent offensive scheme and come together as a team after an embarrassing start, the Tigers could be very dangerous on the road for Florida, but if the same complacent and energy-lacking team from the last three weeks comes to play, this should be a fairly routine game for the Gators, especially given their strong home-field advantage. The key for LSU and Florida will be how they can get their offenses going. Given the poor depth on the Tigers' defense, the Gators have a significant advantage there, meaning LSU will be forced to make that up on offense. The Tigers' offense has been in disarray the last two weeks, with offensive coordinator Matt Canada and Orgeron going back and forth between who's calling the plays and struggling with communication during games. The two coaches of LSU and Florida are similarly feeling the pressure from their passionate fan bases. LSU first-year head coach Ed Orgeron has stumbled to a 3-2 start after another embarrassing loss to division opponent Mississippi State 37-7 in Starkville, leading to questions of Orgeron's firing at the end of the season. Florida head coach Jim McElwain felt similar pressures earlier this season after a flat 33-17 loss to Michigan to begin the season. As for the actual game itself, both programs couldn't be coming in off of more different games. LSU suffered their most embarrassing loss in over 15 years, snapping their streak of 49 straight non-conference home victories last weekend with a poor 24-21 loss to Sun Belt team Troy at home. Conversely Florida struggled early on this season but has found their offense in some tight games this year, playing their best game of 2017 at home last weekend against Vanderbilt, a 34-28 win. With the game moved to LSU last year, Florida will host the Tigers the next two seasons. This weekend's game is the premier game in the SEC for week six and is also Florida's homecoming game, something many LSU fans found disrespectful to the Tigers. Arguably the most fuel to the fire was added just last year when Hurricane Matthew forced Florida to postpone their home game against LSU. Many accused the Gators of being scared of playing the Tigers and after weeks of back-and-forth feuding and name calling between the two programs, the game was rescheduled to be played in Baton Rouge, which Florida ended up winning 16-10 on a goal-line stand. A few years later after the end of the Tebow-era in Gainesville, one of the greatest games between the Tigers and Gators came in 2010 when a LSU fake field goal run helped Les Miles' team to a first down with 30 seconds left in the game. Fakes would continue to be a theme through this rivalry, as in 2011 LSU punter Brad Wing scored a touchdown on a fake punt run, only for an unsportsmanlike conduct penalty to overturn it. Again in 2015, LSU faced a late fourth down with the game tied, calling a fake field goal pass to kicker Trent Domingue to score a touchdown, one that stood this time around. The rivalry began to take shape during 2006-2008, when LSU and Florida won all three national championships those years. In 2006, the legendary jump pass play from Florida great Tim Tebow brought the annual game to new levels. The following year the fire in the game spread to fans as well when Tebow claimed to have received many threatening phone calls and texts from LSU fans, including death threats. One of the biggest rivalries in the SEC, the cross-division showdown between LSU and Florida remains one of the most interesting games of the season each year, but things have gotten even more heated between these two perennial SEC contenders the last decade. After a turbulent and exciting first month of the college football season, the road to the College Football Playoff begins to take shape as October hits. Fall is in full swing and after many intriguing non-conference games, the classic rivalries and heavy implications of conference play begin this week. This couldn't be more true than in this high-stakes SEC cross-division game as rivals LSU and Florida face off in their annual matchup, each looking for their best win of the 2017 season. Welcome to live coverage of the SEC Football! 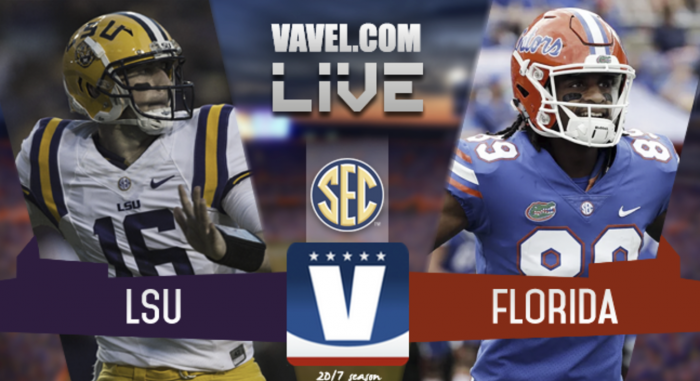 My name is Thomas Cluck, and I am happy to be bringing you play-by-play coverage of LSU vs. Florida here on VAVEL. From now until the game begins at 3:30 pm ET, news, and notes will be above to get you up to speed. Be sure to return before game time for play-by-play updates!